Is There Training for Managing Uncertainty? Certainly! The San Diego Zoo began when a local surgeon had a wild idea to start a zoo with animals abandoned after the Panama-California Exposition. It was the first of many risks we have taken to save animals. Now in our 102nd year, our footprint is global, our aim is to end extinction, and we are taking even bigger risks for animals. With the help of Dorothy Gjerdrum, we've recently rolled out an Enterprise Risk Management program—and developed a set of Academy modules to teach us, and others, how to collaboratively identify, assess, monitor, and address risks—so that we can continue to be healthy risk takers and continue to achieve our audacious goals for the next hundred years. Zoos and aquariums face all kinds of uncertainty these days. Dealing with that uncertainty in relation to your mission and objectives is the goal of Enterprise Risk Management (ERM). The process and tools utilized by ERM take a broader approach to managing risk—one that will help your organization prioritize key risks, allocate resources more effectively, and make better decisions. In short, it helps you make sure that you are "paying attention to the right stuff." When fully implemented, ERM increases everyone's awareness and understanding of how to manage risk—and allows organizations to take risks, too, when appropriate. 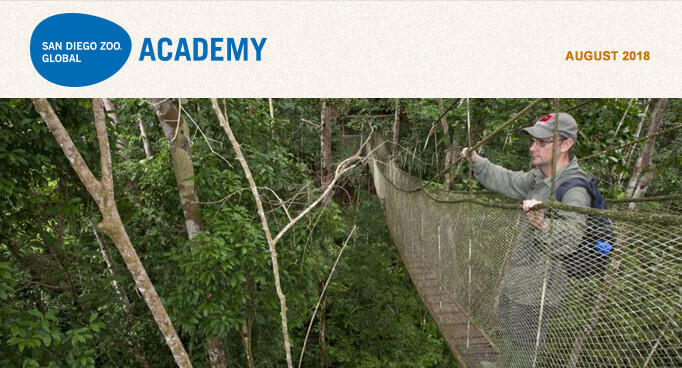 There are two ERM modules available through the San Diego Zoo Global Academy catalog. The first provides an overview of ERM, including how and why San Diego Zoo Global decided to implement it. This module explains the key concepts of ERM, and the outcomes and benefits of the process. The second module walks you through the risk management process, one component of ERM, and provides examples of how to apply that process to both simple and complex risks. These modules provide an excellent starting point for any organization that wants to know more about ERM, and how it is being applied in real life. It will help you understand the importance and relevance of this broader approach, which is based upon the leading international standard on risk management. To quote our ERM Resource Guide, "San Diego Zoo Global is committed to the effective management of risk across all operations, in order to support the achievement of our mission and values, to lead the industry, and to be a world-class organization." For more information about this article and/or the topic of ERM, please contact Dorothy Gjerdrum, managing director, ERM Practice at Gallagher, dmgjerdrum@ajg.com. We hope it is not news that the San Diego Zoo Global Academy offers animal care training for zoo and aquarium professionals. Now we want to introduce our readers to additional helpful information about pursuing a career as a keeper, from San Diego Zoo Global's Rick Schwartz, ambassador for the San Diego Zoo and the San Diego Zoo Safari Park, a new Academy contributor. Rick is a communication expert, and we thought you might like to see his helpful YouTube video on "How to Become a Zookeeper." He is also active on Facebook, Instagram, and Twitter as @ZookeeperRick and has a large social media following. Introducing Rick Schwartz and "How to Become a Zookeeper"
I'd like to tell you a story about Rick Schwartz that I've never shared before. I've known Rick since 2000. He was a keeper working in the San Diego Zoo's Children's Zoo, and he regularly made educational and media presentations with the animal ambassadors in that section of the Zoo. About 10 years ago, San Diego Zoo Global began a search for a spokesperson and ambassador to the media—someone who would also have a strong animal care background. The position was open exclusively to internal applicants, and Rick applied. The interviewing committee was made up of senior staff from marketing, public relations, and curators. I was one of two curators on the interview team. During the course of each interview, someone on the interview team explained we had something hidden under the table. We set the stage, complete with video camera and a PR representative playing the part of a reporter, and asked the candidate to give a two-minute spontaneous interpretation about…a chicken. The candidates did not know that for this interview, we were not so much interested in the accuracy of information presented, but rather how well the candidate maintained their composure and their ability to tell a story under pressure. In addition, the other curator and I were looking for something more. Before each candidate came into the interview, we placed a paper clip on the conference table. When we reached this part of the interview where we were testing public speaking and interpretation skills, we explained that the object under the table was a chicken, and that they had two minutes to tell us about chickens. Secretly, we were also watching each candidate to see if they would notice the paper clip on the table, and if they did, did they do anything with it, once they learned that a real chicken was being handed to them. We said, "Go!" and started a timer. Not knowing much about chickens, some candidates absolutely melted down. Others did an excellent job with the task, but missed the paper clip. Only 2 of the 10 candidates passed this test. Rick was one of them. As the chicken was handed to him, he surveyed the table and saw the paper clip. Without saying a word, he palmed it and quietly placed it in his pocket, realizing it could be a hazard to the animal. His first instinct was to safeguard the chicken, and then begin his story. We were impressed. We hired Rick, confident that the animal's interests would always come before the pressures associated with any appearance on camera in a television studio. For the last 10 years, Rick, now an animal care supervisor, has done an amazing job presenting animal ambassadors and representing San Diego Zoo Global to the public and on the San Diego Zoo Kids channel, as well as on local and national television. Follow the link below to take a look at some of Rick's work, as he gives some tips on "How to Become a Zookeeper." I think you'll be impressed, especially when you learn that he filmed and produced this video by himself. Rick is a very talented guy, and he has a gift for being able to tell a great story. 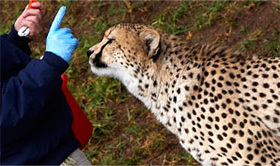 Click to view his video here: How to Become a Zookeeper. The Texas State Aquarium in Corpus Christi, Texas, is part of the Academy's collaborative learning environment! Thank you, Zoological Registrars Association, for becoming a collaborative partner with the San Diego Zoo Global Academy, and good luck with your important efforts! A highlight for us each year is to talk training with everyone at the Association of Zoos and Aquariums (AZA) Annual Conference, which is being held in Seattle this year, September 23–27. See you there—we are at Booth #721. Please join us for the Administrator's Users Group Webinar, hosted by Academy partner CypherWorx. The next webinar is Wednesday, August 15, at 11 a.m. PDT. Note: In the midst of writing my column this month, I had an opportunity to read what Gary Priest says about Rick Schwartz (above), and to watch Rick's "How to Become a Zookeeper" video—and this prompted a change in direction for my column. The brief reflection that follows lays out some of the lessons I picked up from Gary and Rick. It is our great "privilege, opportunity, and responsibility" to be better every day in our care and stewardship of other living beings. Being good caregivers is endless, hard work. For those of us called to such service, it is more a way of life, in which our daily actions demonstrate our great love and respect for the animals entrusted to our care. That is how best to speak with and engage both the public and our critics. We get, understand, and share their concerns regarding animal well-being. More important than acknowledging that is doing what we do daily to become better and improve and protect animals' lives. Starting with each individual animal, elevating animals' interests, working hard to better serve them, and focusing on doing what matters most speaks volumes to those who really care. And that, we do. © 2018 James F. Gesualdi, P.C. The opinions expressed herein are solely those of the author. This is not, nor should it be construed as, legal advice.